Examples, solutions, videos, worksheets, games and activities to help PreCalculus students learn how to use the half angle or double angle formula in some examples. The following diagrams show the half-angle identities and double-angle identities. 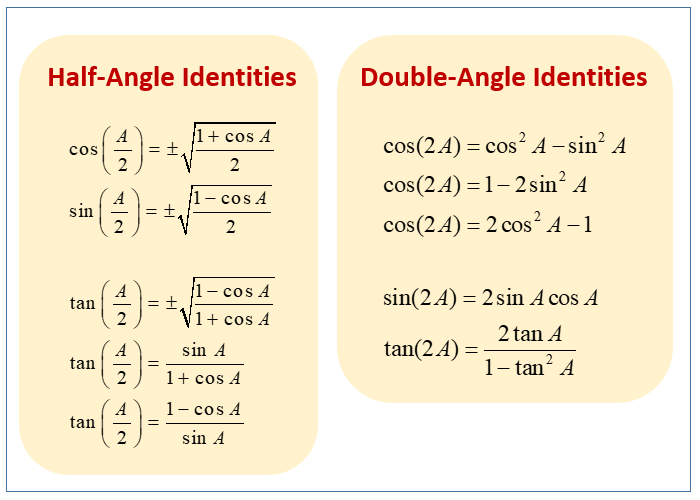 Scroll down the page for more examples and solutions on how to use the half-angle identities and double-angle identities. 3. Given cos A = -2/3 in quadrant II, determine cos(A/2), sin(A/2) and tan(A/2). 1. If sin A = 3/5 in quadrant II, find the exact value of cos(2A), sin(2A) and tan(2A). Then determine the quadrant of angle 2A. 2. Determine cos(A) given cos(2A) = -3/4 and terminates in quadrant III. Rewrite the following trigonometric expression using a half angle identity. Solve on the interval [0,2π). How to solve a Trigonometric Equation Using a Double Angle Identity?